The Divine Mercy devotion comes from the revelations of an uneducated Polish nun in the 1930's. Sister Faustina (now a saint) was entrusted with the message to help the world focus on and take advantage of God's endless mercy. Though His mercy is not a new concept, the Old and New Testament are both full of tales of God's mercy, this devotion is meant to call us to a deeper understanding. Faustina wrote a 600 page diary chronicling the message as Jesus unfolded it to her. The message is really simple: ask for God's mercy and take it in, as it becomes part of you, then let it flow out by becoming a channel of His mercy to others. Trust in His mercy completely, and the more you trust, the more you receive and the more you receive the more you can pass on, rippling grace and changing the world. It was on Divine Mercy Sunday 2015 that Pope Francis announced his plans for the Year of Mercy. The feast of Divine Mercy is celebrated on the Sunday after Easter, as per Jesus' request to Saint Faustina. 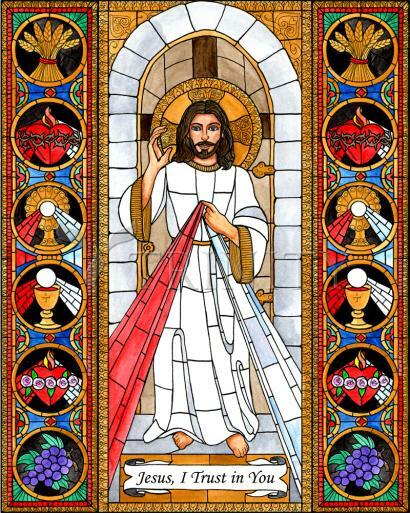 This message and devotion to Jesus as The Divine Mercy is based on the writings of Saint Faustina Kowalska, an uneducated Polish nun who, in obedience to her spiritual director, wrote a diary of about 600pages recording the revelations she received about God's mercy. Even before her death in1938, the devotion to The Divine Mercy had begun to spread. Spend time to learn more about the mercy of God, learn to trust in Jesus, and live your life as merciful to others, as Christ is merciful to you.